After getting huge response from our viewers for Best ‘Android Buying Guide‘, today we are going to introduce – Best PC Buying Guide 2013. Buying a Dream PC either Desktop or Laptop is as easy a sharpening a pencil and as hard as searching any thing in a dark room. I remember the day when me and my father went to a computer shop for buying a computer, at that time I am unaware about any thing related to PC, even i don’t know what is GB. So the computer i purchased at that time was not successful today. If you want to buy an PC for you home or you want to keep it on a stable place then you should go for desktop. But if you want to spend most of your time with PC then Laptop is an Ideal buy. Let me very honest, Desktop are more reliable, performance able and cheaper than the Laptop. Before finalizing any thing always cross check the prices of items. The Ram must be at least of 4G, but if you are professional then at least 8GB RAM is a must. Always remember that more the RAM, more will be the performance. If you are buying the PC for performing heavy tasks, such as Video Editing then 16GB RAM is must. For normal usage we consider 4GB RAM, also DDR3 is faster than the DDR2. There are thousands of motherboard manufacturer in the world, it basically depends on you for which you have to go for. Before buying a motherboard, first check and make sure that it has HDMI port and at least 4X USB 3.0 ports. The motherboard should support DDR3 type RAM. Also check the Bios. According to your budget buy the CPU for you mother board. The CPU should be quad core, if not at least DUAL core. See with which monitor size you and your pocket comfortable. If you watch lots movies and play games then we consider you to buy the display with Full HD 1080p resolution. Check the contrast, brightness levels, viewing angles and Display type (LED, LCD). It really maters a lot, without a hard drive your computer is nothing but just a cartoon BOX. You should buy at least 500GB hard disk for your PC, if want more then choice is yours. We also recommend you to buy a External portable hard drive, so that you can backup your whole data to that one and there will be nothing to worry about even if your primary hard drive becomes dead. Check out our review on the best external HARD DRIVE – WD MY PASSPORT 1TB. Please do not Install Windows XP its not really safe because hackers loves it. Go for Windows 7, Win 8 or Windows 8.1. The windows 8 is designed for touch screens and its interface is really impressive. It eats only few $ but makes you tense free and specially makes your computer hack less. Always install Antivirus Software to you laptop or desktop to vanish the viruses. The Cabinet for your desktop must be solid and airy. It must have at least 3 vents with 2 cooler fans. Processor speed, CPU GHZ . Dual Core Processor with motherboard – Rs 5500. 4GB RAM – RS. 2,500. 1GB graphics card – RS. 2500. 19inch Monitor for desktop – RS. 7,000. Speakers 5.1 channel – RS.3,550. Cabinet – 1,500 (power supply included). 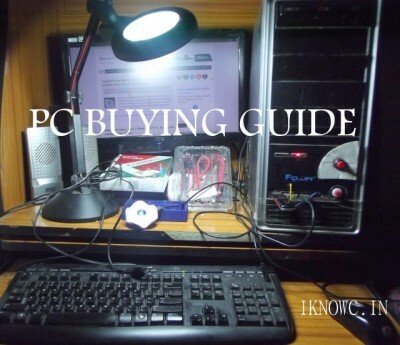 We hope you like our PC buying Guide, if you want to any thing else, let us know by commenting below. hello sir, i wanted 2 knw,does windows phones have adobe flash player..?